Today was an exercise in escaping the rain, first with lunch, then shopping, then tea, and finally dinner and a film at the Filmhouse. 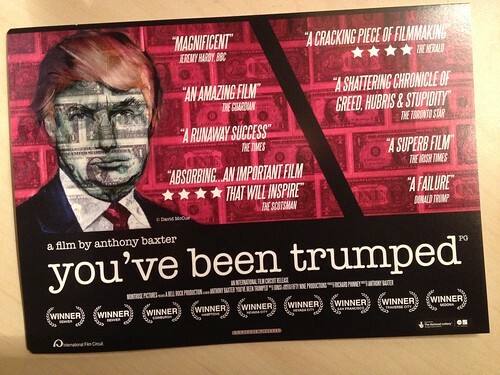 “You’ve Been Trumped” is a documentary about Donald Trump’s new golf courses on the northeastern coast of Scotland. I would like to say it is a good documentary, but it was much too sentimental for my tastes, focusing on the human interest element as opposed to uncovering the more difficult questions behind it all. I still don’t understand how Trump was able to purchase hundreds of acres in an SSSI (Site of Special Scientific Interest) in the first place. Regardless, the documentary turns a critical eye on a celebrity whose greed is overshadowed only by his egoism. I would recommend watching the film if only to be horrified at how little we are doing to stop him. I understand the desire to see “something done” to stop him, but really, if we’re looking to the government to do it we’re going to be perpetually disappointed. He has much more money with which to hire lobbyists than we do. But we can refuse to do business with him, and if enough of us do that it becomes devastatingly effective. No businessman can survive against a public that doesn’t want to engage in commerce. I apologize: call it a knee-jerk reaction given the state of American politics nowadays. Regardless of whether one stands on the Left or the Right, there’s a shared ideology of “the government must fix it” — each successive Administration claims more powers in the interests of “fixing it.” As an example, President Obama has yet to turn away from the Imperial Presidency established by his predecessor, although he definitely campaigned against it in 2008.